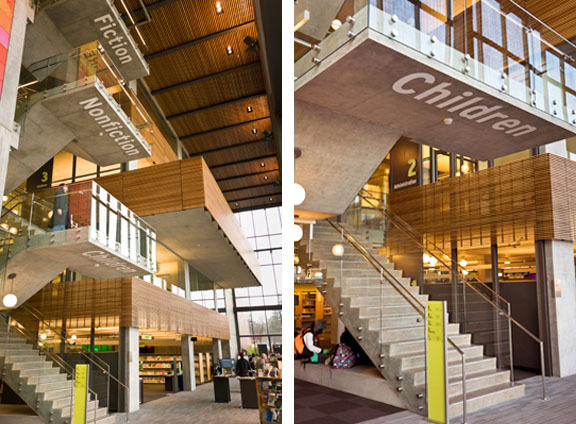 Mayer/Reed was honored with a Merit Award in the 2014 SEGD Global Design Awards Program for our wayfinding design on the Vancouver Community Library. The design team of Mayer/Reed (wayfinding), The Miller Hull Partnership (architecture), and AldrichPears (interpretive installation) was among 32 recognized for excellence in environmental graphic design among 412 entries. The award was presented to Michael Reed, Partner and Kathy Fry, Associate Partner at the SEGD (Society for Experiential Graphic Design) Global Design Awards on June 7 in Atlanta, GA. The award program is the only international design awards focused on communication in the built environment.